It has been a while since I have done a Focaccia bread. This time I thought that I would make it a meal in and of itself with lots of toppings. Grilled chicken, roasted red peppers and feta sounded like it would do the trick. It was pretty good even though most of the toppings kept falling off. Let rest (covered) in a warm place until it doubles in size. Knock it down and flatten it out. Place on a baking sheat with sprinkled with cornmeal to prevent sticking. Brush the olive oil on top of the bread. Bake in a preheated 350 oven for about 10 minutes. Add the toppings and continue to cook for another 10 minutes. Marinate the chicken in the lemon and dill for about a half an hour. Beautiful focaccia. 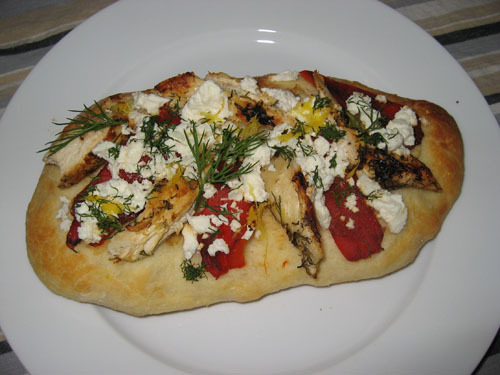 I love the idea of making a focaccia a meal. Great new blog! Okay, Im making meatball sandwiches tomorrow and I am going to make the bread. I am going between the focaccia and the french bread. I think I am less likely to eat the entire loaf with the focaccia.